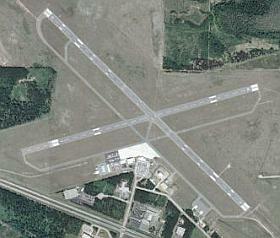 The Bemidji Regional Airport, is a public air station, located 5 km northwest of that city in the Beltrami county, north of Minnesota. Actually it covers an area of a half hectares and have two tracks for to serve the local and commercial air traffic of the region. During the decades of 1950 and 1960 several projects of Unites States Air force (USAF) and NASA among other agencies and various Universities used it to conduct experiments involving stratospheric balloons. The northern location of the city was specially suitable to perform flights related to Cosmic Ray research because at northern latitudes the incoming particles are less deflected by the earth's magnetic field allowing a better exposition to such particles of the equipment (emulsion plates, detectors, etc) or test subjects (mice and other animals). Also the site was relativelly close to the major center of balloon activity in the twin cities area. The flights were performed during summer or fall months, renting space in the local hangar for payload integration work and testing of the instruments to be flown. The last balloon flights were performed there in 1966. 7/29/1960 04:54 CST ~ 15 h ANIMAL CAPSULE After the parachute opened, an antenna suspended bellow the payload was torn off. The resulting loss of radio contact caused a delay in recovery of the capsule. 3 mice survived.